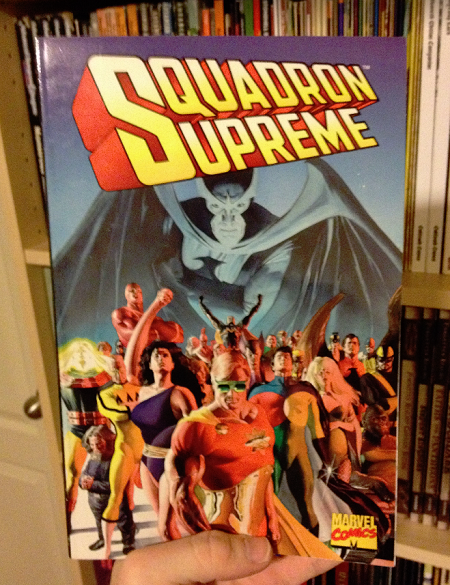 This is officially the weirdest collectible I own: the first printing of the collected edition of Squadron Supreme, which has creator Mark Gruenwald’s cremains mixed into its ink. My wife says we should keep a camera on it at all times, just to see what happens. I was given the final issue of the series by a teacher in 4th or 5th grade, and it was like no other superhero comic I’d read before: no clear villains, just two groups of “good guys” killing each other. I read and reread it dozens of times, and it’s fair to say that part of my love of deconstructed superhero comics comes from Squadron Supreme #12. Yet, somehow, I never went back to read the rest of the series. I’m looking forward to rectifying that.